This is a guest post from DexaFit.com, a company offering predictive fitness and health testing (including DEXA scans, Vo2max tests and more). Be sure to leave your feedback in the comment section at the end of the article. How Do DEXA Scans Work? 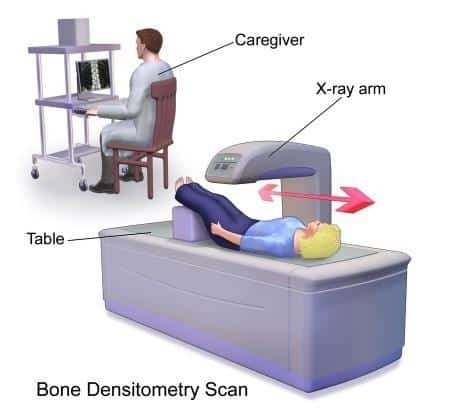 Dual-energy X-ray absorptiometry (DEXA) scans operate through the use of X-ray beams to determine an individual’s bone mineral density. Two X-ray beams at different energy levels are aimed at the bones of the individual receiving the scan. Using X-ray beams with differing energy levels is important because the X-ray beams at one particular energy will be absorbed by the soft tissues, while the X-ray beams at the other energy level will be absorbed by the bone. X-ray beams that are not absorbed by either the tissue or the bones pass through and are detected on the other side of the body. The higher the density of the individual’s bones, indicating a higher mineral content, the greater the amount of energy that will be absorbed, leaving less energy to pass through and be detected on the other side. The amount of both X-rays detected on the other side is measured and used to determine the amount of energy absorbed by the tissue and bone. The amount absorbed by the soft tissue is then deducted from the overall absorption value. The individual’s bone mineral density is then calculated based on the amount of X-ray beams absorbed by the bone. The bone density value may be given in units of g/cm2, or in the form of T-scores or Z-scores. These scores use formulas to produce a value that relates the individual’s determined bone density with that of the average peak bone mass for the individual’s gender or age. What Does a DEXA Scan Procedure Involve? Undergoing a DEXA scan is actually quite simple, and is performed on an outpatient basis. It is a noninvasive medical procedure, meaning the entire test is performed without requiring the use of any instruments inside of the individual’s body. No exercise or vigorous activity prior to the test. A small fasting window before the scan may be required. Refrain from calcium supplements for 24 hours previous to the procedure, such as is common with many surgical and other medical procedures. Be sure to disclose any possibility of a pregnancy, as the radiation exposure from the scan may be determined unsafe for the fetus. You may be asked to wear a hospital gown, depending on the type of facility and regions of the body being scanned. You'll need to remove all jewelry and other metal objects that may interfere with the scan. Once the technologist has placed you in the appropriate position, the technologist will trigger the scanner and perform the test, and the scan’s images will be produced on a computer connected to the machine. The entire process is normally completed within 10 to 30 minutes and is entirely painless; exactly how long the scan takes will depend on the particular machine being used and which body parts are being scanned. The X-rays used during a DEXA scan procedure impart only a very low dose of radiation to the individual receiving the scan, often much less than even a typical chest X-ray procedure, making DEXA scans very safe. Why Get a DEXA Scan? Additionally, DEXA scans are recommended for women once they reach age 65, and men aged 70 and above. The data you receive following a DEXA scan procedure will often include a value referred to as your T-score. This value is a standard deviation or a representation of how far away your bone density score is from that of the average peak bone density. A positive T-score indicates that your bones are stronger, or have a higher density than the average peak bone density of a healthy adult, while a negative T-score indicates the opposite. Each standard deviation indicates an approximate 10 - 12% difference in bone density from the average. Any T-score greater than -1 represents an individual with normal bone density, as determined by the rankings established by the World Health Organization. Osteopenia is indicated by a value falling between -1 and -2.5, while an osteoporosis diagnosis is warranted by any score less than -2.5. Another value calculated from DEXA scan results is known as the Z-score. This is similar to the T-score, but instead represents the deviation of your bone density from that of the average individual of your same gender and age. These scores can be especially informative in making assessments about body composition, rather than the customary statistics, such as BMI, which traditionally don't take age or gender into account. Hydrostatic weighing, or underwater weighing, is another well-known method used for the purpose of obtaining body composition information or body fat measurements. However, there are differences between hydrostatic weighing and DEXA scans that should be considered. Hydrostatic weighing uses the tenets of the Archimedes Principle and determines body density based on the volume of water displaced by the individual’s body. This is accomplished by first measuring the weight of the body outside of water, then under water after exhaling all air out of the lungs. The volume of the displaced water and the density of the water are used to calculate the density of the individual’s body, which is then placed into a formula to calculate the individual’s body fat percentage. Hydrostatic weighing tests can be quite expensive, though, and it is often difficult to locate a facility that performs this type of test in many areas. Additionally, complete exhalation of all air from the lungs before being placed underwater proves tough for many individuals and can be a much less comfortable experience than a DEXA scan. This residual air volume in the lungs can also contribute to a reduction in the accuracy of the test results. Is a DEXA Scan Right for You? A DEXA scan may be the right choice for you, for a variety of reasons. Besides choosing to receive a DEXA scan to investigate any potential or ongoing health conditions, such as those listed above, a DEXA scan can be a great addition to the tools you currently employ to assess your fitness program progress. It offers much more information and insight than the stats you gain from simply stepping on a scale, and the cost is probably less than you think! The DEXA scan will provide your weight, but it will also produce values for your body fat percentage, along with values referring to your body composition, such as your bone density and muscle mass. If you've been wondering if your current diet or exercise plan is effective, or how to improve it, a DEXA scan could be a great option. It is an accurate and reliable way to learn some of these advanced body composition figures and stats. Tracking them over time can be extremely useful in aiding you in determining how to tweak your current fitness regime for further improvement and to achieve your particular goals. Leveraging a network of on-site and telemedicine practitioners as well as medical-grade diagnostic testing, DexaFit provides a quantifiable, evidence-based approach to health and wellness. By combining predictive fitness and health testing, our approach offers several layers of benefits that make it easier for people to perform better, think faster, and live better using a proven blend of science and innovative technologies.